Tipton Builders Inc. is a family owned and operated business continuing the tradition started over 40 years ago in Eastern Carolina. Although custom home building is our specialty we are well versed and very experiences at renovations, repairs, restorations, and even commercial building. GO Architectural Design, PLLC is a full service architectural firm focusing on helping clients achieve their design needs including new house design, historic properties, interior design, commercial properties, and energy efficient design. We believe in a no wasted space approach to designing and keep our designs within budget. GO Design GO Build, LLC is a full service construction and interior design firm focusing on remodeling, additions, kitchen and bath renovations, outdoor living spaces, and historic houses renovations by helping clients take their projects from design through the construction process. We use 3D modeling and CAD drawings to create and present design solutions to our clients. Each project is estimated and presented with clear numbers showing all elements of the design. Let us take your project from Start to Finish. 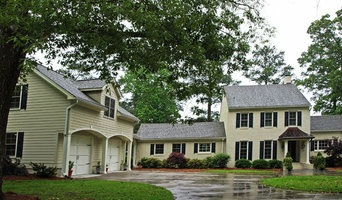 We're an established and experienced remodeler in Eastern North Carolina. We don’t just build projects; we build dreams. We design and build kitchens, bathrooms, garages, decks, and any type of addition or renovation you can imagine – right here in Eastern NC. 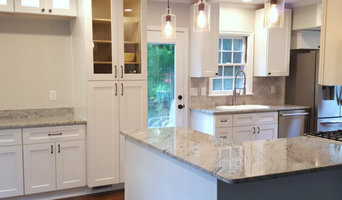 As a local, established contractor / builder based in the Pollocksville, NC area, Bender Remodeling strives to meet Eastern North Carolina’s construction needs, and have been in the business since 2001; whether you need a kitchen remodeled or an entire home renovated, we’re dedicated to doing it right the first time. Contact locally at 252-670-6188, or through the Houzz phone line listed above. Margaret's design philosophy can be summed up in 4 words. Listen. Observe. Detail. Create. Margaret LISTENS to her clients' needs and desires. She OBSERVES their environment, habits, daily lifestyle patterns & functionality within the space. By paying close attention to every DETAIL, Margaret is able to CREATE highly functional, engaging spaces that exceed her client's expectations. Margaret's friendly & informal approach to her design projects sets the tone for comfortable & relaxed meetings with her clients. She attributes her successful designs & happy, returning clients to her design philosophy. Margaret's personal design style is inspired by nature, with a unique blend of simplicity, comfort, & beauty. Margaret is able to bring the 'outside in' & create sophisticated, yet undeniably fresh designs. Through channeling her clients' passions, desires & interests, she is able to design livable & timeless reflections of their individual styles. Margaret aspires to deliver her clients' dreams, by focusing on the quality of the space, rather than the quantity of the space. Inspired by the essence of the seashore, Margaret has the ability to grasp the lure of Coastal Blues in her designs, by using a palette of maritime blues, with dune-grass greens. She mimics the light-hearted airiness of a cool summer breeze by incorporating soothing hues, crisp whites & beautiful splashes of inspirational colors. Her designs are reminiscent of a relaxing lifestyle or a spa-like retreat that her clients look forward to coming home to. Margaret uses this color palette when she designs commercial & residential bathrooms & bedrooms. 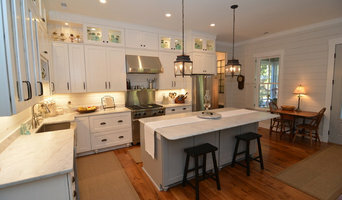 Her use of warm whites blended with rich stained finishes abound in her kitchens designs. She harmoniously blends the flooring, intriguing countertops & tiles to seamlessly enhance the pleasure of cooking. Margaret embraces each of her design projects with renewed excitement in the anticipation of what new challenges await her, just behind the next door. She strives to exceed her clients' expectations, and to keep them well informed throughout the project. As an educated & experienced interior designer & educator, Margaret has a vast skill set to offer her clients. She is able to design & present virtual tours, 3-D computer generated drawings of her design ideas & AutoCAD drawings. Since 2001, Harbor Point Contracting, Inc. has been adding value and style to homes in Historic New Bern, NC and it's surrounding communities in Eastern North Carolina. Building Your Dreams with Quality, from concept through completion, we are with you. Licensed, Experienced, Insured, & Professional. Located at 3964 Dr. M. L. King Jr. Blvd. New Bern, NC 28562. Call Harbor Point Today to request your free estimate! 252-634-9936. Please allow ample time to get on the calendar. We look forward to serving you! New Bern and Greenville NC home builder, Tab Premium Built Homes, is the premier home builder in eastern North Carolina. We have Design Centers located in both New Bern and Greenville NC to better serve our clients. We build custom and semi-custom homes with the same charm, craftsmanship and attention to detail that characterizes the historic homes of our eastern seaboard. Yet our technologies, design and green building techniques are thoroughly modern and state-of-the-art. From concept to completion, we build the most distinctive homes, renovations and select commercial projects in eastern North Carolina- on time and on budget. Located in Greenville, North Carolina and serving all of Eastern North Carolina, Taylor Builders are licensed and fully insured experts in roof installation, home repair, remodels, and custom home building. Regardless of the complexity, size, or design of your project, Taylor Builders are here to provide you with full guidance about your residential construction requirements. 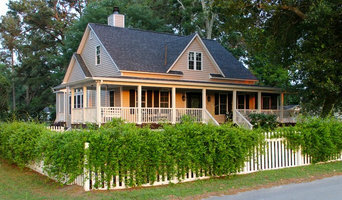 McClay Custom Homes is a licensed general contractor in New Bern (Craven County) NC. With over 34 years of combined experience, we have hundreds of satisfied customers from 1997 to present. Bill McClay grew up in New Bern, NC and a move back east from Raleigh, NC allowed him to start up operations and continue building quality homes here and in the River Dunes community outside of Oriental, NC. Bill prides himself on his customer attention throughout the home building process. The customer should always know what is happening with their house and feel at ease being part of the process. Two other keys to Bill's home building philosophy are quality built homes and energy efficiency. Attention to detail and job site accountability are expected to insure quality, and construction planning and practices recognized by the U.S. Environmental Protection Agency and U.S. Department of Energy insure energy efficient homes. At Artisan East Custom Homes we offer the highest quality Energy Star certified homes available today. Our passion for building beautiful, exceptional homes leads us in our search for new and innovative materials, trends, designs and construction methods. When you choose us as your North Carolina home builder, you can expect us to meet your needs on time and within budget. At Kit Corp., our goal is to distinguish ourselves from the ordinary New Bern NC home builder by striving to be different. Billy Russell has lived in New Bern, NC his entire life. He and his wife Donna believe in the importance of building homes that they can be proud of. Billy builds each home as if it were his own. As a licensed general contractor, Billy has assembled a top-notch team of subcontractors based on years of experience in the building industry. He knows that a well built home starts with conscientious craftsmen and high quality materials - from the foundation to the rooftop. Billy and Donna believe that every home should have the amenities and elements that make new homeowners proud when they say , “Welcome to our new home !” Our success has been based not only on a strong commitment to quality, innovation and attention to detail, but also on our endeavor to provide and maintain a high level of communication between Kit Corp. and our homeowners. Personal attention to each client is maintained wherever you may be! Using today’s technology enables us to include all homeowners in the building process – even from half way around the world! At Kit Corp, we derive personal satisfaction in creating homes that-like fine work of art-are truly one of a kind. As a New Bern Home Builder and General Contractor, Billy Russell and Kit Corp Homes is the leading New Bern Home Developer. New Homes, Home Renovations, Home Remodeling and Home Additions are what Kit Corp Home Services pride themselves. Since a picture is worth a thousand words, we invite you to look over this web-site and see for yourself the commitment to quality and attention to detail that you will find in all of our custom homes around New Bern NC. When you contact Hammond Services & Contracting, we’ll schedule a free in-house consultation to discuss your project. We’ll also inspect your home or business facility to get a better idea of how we can bring your vision to life. Then, we’ll explain your options so you can make an informed decision. Our Johnston County general contractors will answer whatever questions you may have throughout the process. We’re dedicated to making sure you have a pleasant experience from start to finish. Trust our service-driven crew to help you make the best choices for your property. We’ve been providing our services to residents in and around Clayton since 2004. Our home addition contractors use turnkey products so you can start enjoying your newly remodeled space right away. You’ll love the look or your new living space or work area once we’ve finished the job. Contact us today to schedule your remodeling work, exterior home renovation or bonus room addition in the Johnston County area! Eastern North Carolina’s premier green builder, Kidd Construction Group, is a family owned and operated construction company that desires to cater to the needs and desires of our clients in building the home of your dreams. We care about our customer’s satisfaction and want the process of building your home to be smooth and enjoyable. We demonstrate quality of construction through attention to detail, value-driven design, and energy efficient construction. Through our knowledgeable team, we will guide you through the process of building your home. We offer practical insight, flexibility, and extensive knowledge. Contact us and we are sure you will agree that Kidd Construction Group is the builder to make your dreams a reality. Ty Gay Builders originates from decades of construction experience in custom building, residential and commercial projects. We specialize in a variety of areas to guide you from planning and designing to well after taking ownership of your property. Whether you are preparing to build a new home, or restore/renovate an existing one, Ty Gay and his team of professionals and craftsmen are available to help you achieve your building goals. We invite you to have a look at our website, learn more about us, our projects and the services we can provide.